Firefox uses SQLITE databases to store lots of its settings. By the time the databases grow and Firefox starts working slowly. It will take a lot of time to load during startup, the overall speed will be effected, and browsing Histories will be too slow. This is very common problem and it occurs largely because of fragmentation of databases. SpeedyFox takes care of any database fragmentation and thus makes Firefox zippier. 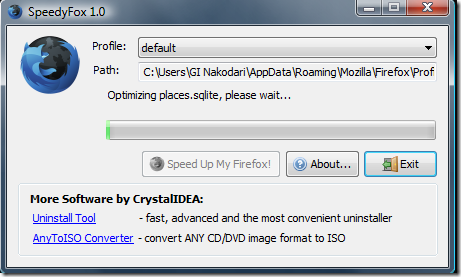 You might not see a difference if you try SpeedyFox on a fresh Firefox install, it works great after you have been using Firefox for some time. Just close Firefox, run SpeedyFox and point it to the profile you want to optimize. 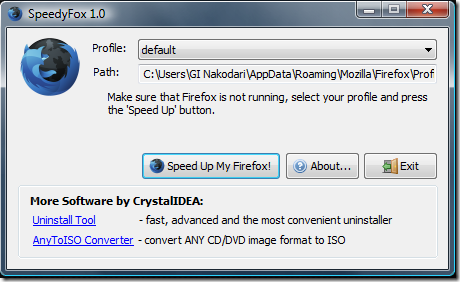 Once installed, SpeedyFox automatically detects your Firefox’s default profile. If you have more than one profile, you can select the one you want to optimize from the drop-down menu. If you have portable version of Firefox, choose your profile path manually by selecting “Custom…” profile. All you have to do is hit the Speed Up Firefox button. The optimization process can take anywhere from 5 minutes to an hour depending on how large your databases are. The whole optimization process is safe as it does not effect your history, bookmarks, passwords, etc.